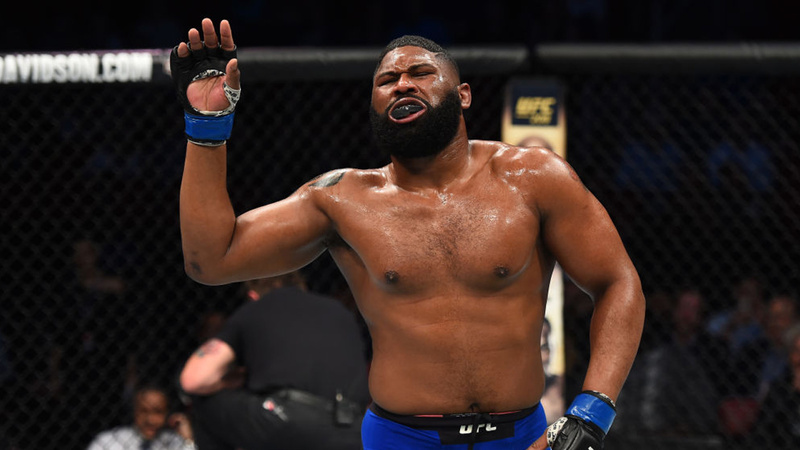 Top heavyweight contender Curtis Blaydes who’s coming off a dominant third round TKO victory over Alistair Overeem at UFC 225 in Chicago last month. With an impressive performance, Blaydes put himself on the shortlist of heavyweight title contenders. This is a big win for Curtis in terms of rankings and future promise and currently riding on four straight wins in a row. The only blemishes on Blaydes resume are the Texas commision overturning his TKO win over Adam Milstead at UFC Fight Night 104 after Blaydes tested positive for marijuana and a TKO loss to fellow UFC heavyweight Francis Ngannou at Fight Night 86. Then in the main headliner, Daniel Cormier knocks-out Stipe Miocic to claim the heavyweight title and become the only second fighter in UFC history to hold title in two weight divisions simultaneously. Instead of calling any top heavyweight contender, Cormier called out former heavyweight champion Brock Lesnar, whose last win over Mark Hunt at UFC 200 was overturned due to his drug test failure, went inside the Octagon on Cormier’s call and shoved him. At post-fight conference, Cormier himself not against the idea of another fight before throwing down with Lesnar, but it has to be big money. Blaydes, of course, didn’t like how Lesnar swoops in and lock the title fight. Lesnar getting a title shot, it’s a showdown that would sell a lot of pay-per-views. That Blaydes nor any other heavyweight contender is not going to outdraw Brock Lesnar. Do you think Blaydes will get a title shot before the year-end?